Co Tyrone YFC held their annual efficiency awards dinner on Saturday 3rd March in Floyds, Ballymagorry, kindly sponsored by Foyle Meats. It was a night to acknowledge and reward the clubs and their office bearers for the hard work that they have carried out over the past year. A great night was had by all, with all 10 Co Tyrone clubs being represented. 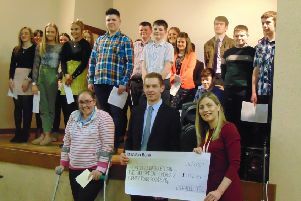 Many thanks must go to Elaine Crozier, Louise Halliday and Thomas Chambers, from Collone YFC for judging the efficiency competition and member of the year. Thanks must also go to Foyle Meats for their continued sponsorship and to Floyds for the use of their premises.